It's here! The audiobook, "A Catholic's View of Sin" is finally ready. I started producing this 44 minute audiobook on August 1, 2016 and after many long days and hours it is out of production and ready for listeners. A Catholic's View of Sin is available today at Audible and soon to be released at iTunes and Amazon. Listen as I narrate James Nugent's frank discussion about the Catholic world view of sin and how sin affects both Christians and non-Christians alike. "Sin is insidious!" Mr. Nugent explains in this comprehensive analysis of The Ten Commandments and how sin can ruin our lives. Thankfully, we have a loving Father who forgives us of our sins which allows us to start over and begin a better, more fulfilling life. Pick up your copy of A Catholic's View of Sin today and discover the convenience of listening to books. Learn how you can get your first audiobook free when you subscribe to a free trial membership at Audible. Before entering the voice acting profession, I studied a lot. 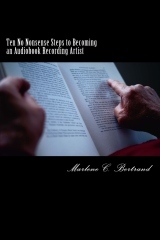 I took plenty of notes and afterwards, when I saw how helpful my notes were, I organized my notes into a book titled, "Ten No Nonsense Steps to Becoming an Audiobook Recording Artist." The book is available on Amazon and Kindle. One chapter in the book is devoted to taking care of the voice and foods a voice actor should avoid before beginning a recording session. I wrote an article about foods to avoid and published it with the hope that I could help new voice actors avoid common mistakes in the recording studio. The article is titled "Voice Artists Don't Eat Polish Sausage - Foods to Avoid Before Going Into the Recording Studio." The following video provides some additional tips that help you take care of your voice. It was created for teachers, but after watching this video, I discovered that it applies to voice actors as well. The narrator explains how to sit and stand to produce better quality sounds from your voice. There are also some helpful tips such as how to stay hydrated and how to properly clear and protect your throat.